Chris Tinker, Chief Technologist at Hewlett Packard Enterprise joins Hal Woods, CTO at Datera to discuss some of the leading technologies in the Software Defined Revolution, and how HPE and Datera help cultivate the vast ecosystem of solutions. 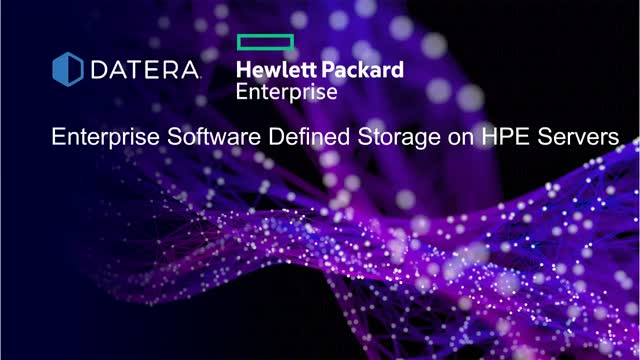 Data is at the center of the Software Defined Data Center, where Datera reimagined enterprise storage and partnered with HPE to deliver a complete solution. Discover the architecture behind high-performance storage with Datera data automation on Fujitsu PRIMERGY servers. Richard McCormack, Head of Product Solutions at Fujitsu, joins Bill Borsari, Systems Architect Director at Datera, to share how Datera and Fujitsu PRIMERGY systems are leading the software-defined revolution by providing the most powerful and flexible data center innovations across a vast ecosystem of solutions to turn your IT into a business advantage. Don Molaro, Chief Technical Advisor at World Wide Technology joins Hal Woods, CTO at Datera, and Bill Borsari, Field Technical Lead at Datera, to share their experience and advice. Learn the key requirements and technology options available to architect your future data operations, rightsize your budget and transition to a software-driven world. Have questions on how to automate your data environment at scale and want answers? No presentations, no scripts, no marketing gimmicks, just your questions answered straight up without intervention by corporate hacks. Special guest, Charles Milo, Senior Solutions Architect at Intel joins our senior team of geeks from Datera to answer your questions on how to massively scale and automate a high-performance data environment using applied machine learning to achieve a software defined data infrastructure. You'll learn about what works and doesn't work with a 100% software-driven infrastructure used to power cloud-native applications, get the most out of new technologies like new flash drives and NVMe and not just what Datera does, but why we built the system the way we did and how it operates to powers your data. Bring your questions, and challenge Nic Bellinger, Chief Architect, Bill Borsari, Field Technical Leader, Shailesh Mittal, Senior Software Architect, and Narasimha Valiveti, our Head of Engineering and Charlie will sit down, geek out with you and get all your questions answered on data today. Hal Woods, CTO at Datera talks about the need of the Software Defined DATA Center for 100% programmable storage and how Datera delivers it architecturally. Organizations have tried a variety of solutions to regain control of their data storage infrastructure. They’ve invested in monolithic storage systems, software defined storage (SDS) and hyper-converged systems. While each approach may have brought some value, each failed in its primary task: consolidating storage resources. Each of these consolidation efforts is unable to consistently guarantee performance, scale capacity and drive down storage costs. As a result, most organizations end up buying workload specific solutions for both legacy and modern applications. Most data centers today have a mixture of multiple all-flash storage systems, hyper-converged environments and high capacity data archives. They also have storage software for each use case. IT ends up dealing with a data management nightmare, which limits organizational efficiency and productivity. Don’t give up! Join Storage Switzerland and Datera to learn how monolithic, software defined and hyper-converged architectures have let IT down and why the problem gets worse as data centers modernize. Attendees will learn how storage solutions need to change in order to eliminate primary storage silos while guaranteeing specific application performance, scaling to meet capacity demands and lower storage TCO. Discover revolutionary advances in software-defined architectures and storage for private and hybrid clouds, virtualization and Containers. Containers can offer significant benefits for applications that are deployed using them. However, deploying containers at scale has significant implications for IT infrastructure, including storage management. A careful examination of the storage challenges presented by the various container systems and orchestration tools is essential to making the right choices for your environment. This webinar explores the storage challenges and different options for containers, the tradeoffs and functional differences between file, block and object storage approaches, as well as the architectural considerations and the various plugins available to help bring it all together. Join Google and Datera to learn how you can reap the benefits of the cloud without losing performance as Containers become the new paradigm using Datera Elastic Fabric Storage System and Kubernetes for Container Orchestration. Containers are rapidly maturing. As container adoption continues to grow beyond stateless applications to stateful workloads such as MySQL, Kafka, Cassandra, and Couchbase, the need for persistent storage is foundational. To make business workloads adoption grow on container platforms, it is imperative to simplify persistent storage provisioning and consumption. Enterprise customers and service providers have been researching ways to find a modern day storage solution so they can move away from the traditional monolithic infrastructure environments. Customers have been looking for ways to remove silos, reduce OPEX/CAPEX, create operational efficiency – all with large scale-out capabilities and cloud agilities without sacrificing performance. This webinar is to share how customers can achieve these goals with a truly software-defined storage solution. Companies have transformed seamlessly from traditional storage environments to flexible, cloud-like agile environments. Hear from Steadfast, a service provider leader, who enables their customer base to focus on their company priorities to grow the business instead of spending the unnecessary time to maintain and manage their traditional storage infrastructure. It seems like every storage company these days is talking about software-defined storage (SDS)… and for good reason. Software-defined storage provides transformational benefits for companies on a wide scale. For IT organizations, SDS technology enables infrastructure to scale to meet modern data demands, while reducing cost, improving hardware flexibility, speeding deployments, and dramatically simplifying storage infrastructure management. Register for a chance to win an Apple Watch 2. As excitement mounts around SDS, a wide variety of storage industry solutions have begun leveraging the term. Some solutions, however, may not deliver all the expected benefits of SDS despite leveraging the name. The result has generated some confusion that in turn may lead some to delay SDS-based deployments. In response, it is important to understand what SDS technology provides in order for the technology to be effectively leveraged to transform IT infrastructure. - What advanced capabilities and features to look for in order to ensure that your organization is able to maximize the benefits of SDS. Join Enterprise Strategy Group and Datera to learn how to understand software-defined storage and the transformational benefits it provides. This video shows how to provision storage volumes with a Datera System. The processes uses the Datera UI. In this demo, we will show how easy it is to deploy a Datera cluster and a Kuberenetes cluster in the Google Cloud Platform. Datera is deployed in Google Compute Engine and Kubernetes is installed in Google Container Engine. We will install and configure Datera's Kubernetes persistent storage driver, and then using Kubernetes, deploy and manage a CockroachDB cluster (running in Docker containers). The Datera cluster will serve persistent storage to the CockroachDB and seamlessly provision and scale storage as CockroachDB scales. This video shows how to provision storage volumes using templates with a Datera System. The processes uses the Datera UI and Datera templates. This video shows how to create a Datera System and join 8 nodes. The process uses the Datera Initialiation UI, the join UI, and joining nodes via API. Discover how to create flexible, API-focused scale-out storage that supports today’s demanding enterprise applications. Join the live webinar from Datera and Packet.net for an advanced customer case study and technical deep dive. Viewers will get insights on how elastic block storage is evolving in on-premises clouds, challenges with current storage solutions scaling beyond a rack, and data center alternatives for service providers and cloud builders. Learn about Datera’s unique solution to scale easily across the data center and hear from Packet.net on how they are operationalizing Datera Elastic Block Storage. This insightful webinar is designed for service providers and data center professionals chartered with providing a high performance, consistent and profitable elastic block storage. Join Google and Datera to learn how you can reap the benefits of the cloud without losing performance as Containers become the new paradigm using Datera Elastic Fabric Storage System and Kubernetes for Container Orchestration. Register for a chance to win an Apple Watch 2. Register today to gain key insights from our industry experts! What your apps want. Storage for the cloud era. Datera is challenging traditional datacenter models, and creating a new data fabric to continuously deliver infrastructure in real-time. Easy to use and scale - automated infrastructure that continuously adapts to business needs. Infrastructure never was so elegant.